Natasha F. Dalomba ’14 speaks to current Harvard students about her experience in the nonprofit sector. 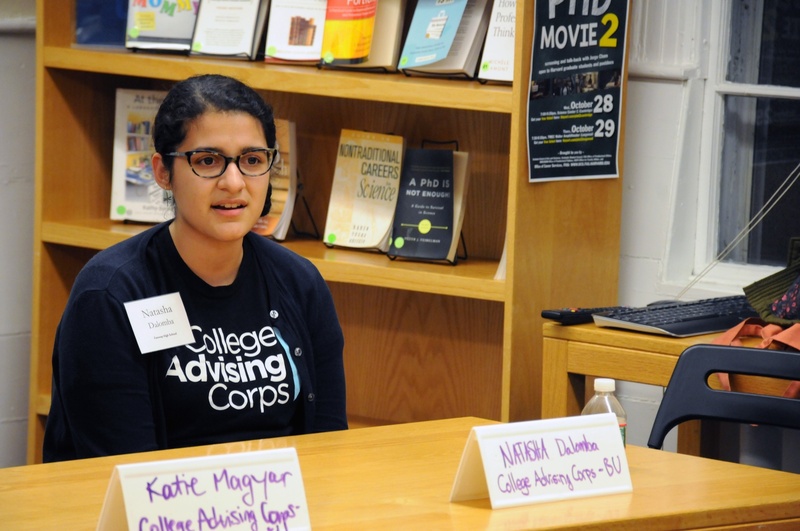 She was representing College Advising Corps, through which she helps current high school students from disadvantaged backgrounds acquire a college education. Happy December– wait what, how did that happen already? On this day in 1982, the King of Pop released his album “Thriller.” We hope you have a thrilling last Tuesday of classes. Today’s going to be 45º and rainy. At least it isn't going to snow? It's gift-exchanging season, and you definitely don't want to let your Secret Snowflake down. Facebook Group Celebrities: Where Are They Now? Seriously, what happened to them? Flyby investigated. The semester is coming to an end, folks. The masters of Harvard’s undergraduate residential Houses are discussing changing their shared title—one that some students criticize as associated with slavery and Harvard College Dean and Cabot House Master Rakesh Khurana says makes him personally uncomfortable. Facing a group of expectant students in a campus lecture hall on Monday, Harvard Law School Dean Martha L. Minow did her best to mollify students who have called on her to improve campus race relations, demands that intensified after a racially-charged incident shook the school two weeks ago. After almost eight years, Richard W. Wrangham and Elizabeth Ross will step down from their positions as Currier House Co-Masters at the end of the 2015-2016 academic year, looking to focus more on their research and professional pursuits. Against the backdrop of the Paris climate change discussions, a crowd gathered at the Kennedy School on Monday night for an advanced screening of “Racing Extinction,” a documentary about species extinction by Academy-Award-winning director and National Geographic photographer Louie Psihoyos. Courageous Conversations and Bystander Intervention — The Title IX Office is hosting a discussion with Tom Tremblay about preventing sexual assault through bystander intervention in Fong Auditorium at 7:30 p.m.
World AIDS Day Vigil — Come to Memorial Church at 7:30 p.m. to hear from Brook Baker and Marguerite Thorp Basilico. Concert by Composer Steven Kazuo Takasugi and the Talea Ensemble — 8 p.m. at the Knafel Center.